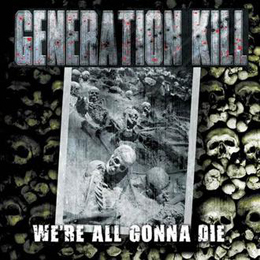 Genaration Kill (2008) is: Rob Dukes (Vocals), Rob Moschetti (Bass/Backing/Vocals),Jason Trenczer (Lead Guitar), Jason Velez (Lead Guitar), James DeMaria (Drums). Maybe you recognize the name Rob Dukes the current vocalist from the American trash metal band Exodus. Who said “this album is not an Exodus clone. This is an album of music where five guys got together an explored our own roots of music, the records we grew up listening to and wrote songs paying homage to what we love”. I like this cd but you still hear the Exodus influence. That’s not the problem the raw guitar riffs sounds very well. But in the slow numbers sounds it very boring the emphasis is more on the text. It does not appeal to me. Except the slow numbers I like “There Is No Hope and “Friendly Fier”. If you like the Exodus sound then buy this record and skip the slow numbers!